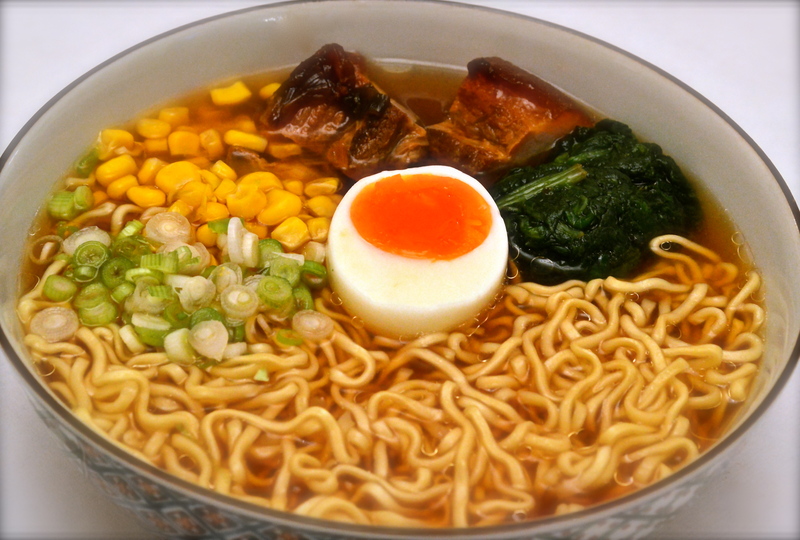 Although ramen is originally Chinese, it is now one of Japan’s most popular dishes. Ramen can be a quick and tasty option or, if you have the time, you can make your own stock and some cha siu pork (kind of bbq flavoured pork made from pork belly), to make it a steaming bowl of home-made goodness. A good stock is the secret to a really delicious ramen. But if you don’t have time, ramen noodles often come with an instant soup base, which is usually soy, miso, tonkotsu (pork broth) or salt flavoured. Cha siu pork see below or some kind of cooked chicken, beef or pork (I often use ham for a super speedy alternative). If you’re veggie, tofu could work too! Prepare cha siu pork see below. Prepare stock. Roughly chop ginger and spring onions, crush garlic. Add to stock, bring to boil. Season. Simmer for 20 mins, occasionally skimming surface. Drain stock, mix in soy sauce OR miso and set aside. Boil eggs for about 5 mins for oozy egg. Peel eggs under cold water. Wilt spinach for a min in boiling water. Drain, rinse under cold water, squeeze out all excess liquid. Drain sweet corn and finely chop spring onions. Bring big pan of water to boil, add ramen and cook for 3 mins or according to guidelines. Put ramen into individual bowls. Ladle over stock. Add a dash of chilli oil if desired. Put a bit of pork, corn, spinach, egg and chopped up spring onion on each. Bring pan of water to the boil. Simmer pork belly for 10 mins to dissolve some fat. Skim off any impurities. Reserve cooking water once done. Meanwhile chop up garlic, spring onions and ginger. Measure out soy sauce, mirin, sugar and honey. Combine garlic, spring onions, ginger and sauce ingredients. Put partially cooked pork in pan with sauce, add porky water and bring to the boil. Turn down heat and simmer for 1 hr. Can be used straight away or leave to soak in leftover sauce overnight.